Just over six months ago, Hurricane Sandy hit the shores of New York, bringing floods and standing water to neighborhoods across the tri-state area. But if the destructive capacity of flooding and water damage was bad, it soon became clear homeowners were faced with an even greater threat. Flooded homes not dried out within 24 to 48 hours were at serious risk of developing mold infestations, threatening the health and safety of thousands of New Yorkers. At the end of January 2013, city administrators created the privately funded Neighborhood Revitalization NYC program ("NRNYC" or "the program") to remediate 2,000 homes, responding to growing reports of mold contamination in the press. The organizations that drafted this report have engaged with the City and the non-governmental agency administering the Neighborhood Revitalization NYC program throughout the several months it has existed, and have been able to provide feedback on the effectiveness of the program. The city and program administrators have been extremely open to feedback, and many obstacles have been improved because of that openness. However, as the results of this study indicate, for a variety of reasons, the city's current approach to mold remediation post-Sandy needs expansion and improvement. Six months later, the acute need for mold remediation across New York City has not abated, and mold's disproportionate impact on low-income and immigrant communities has resulted in displacement, sickness, and continued crisis in Sandy-affected neighborhoods. Major community-based organizations with roots in those neighborhoods have stepped in to help construct solutions. 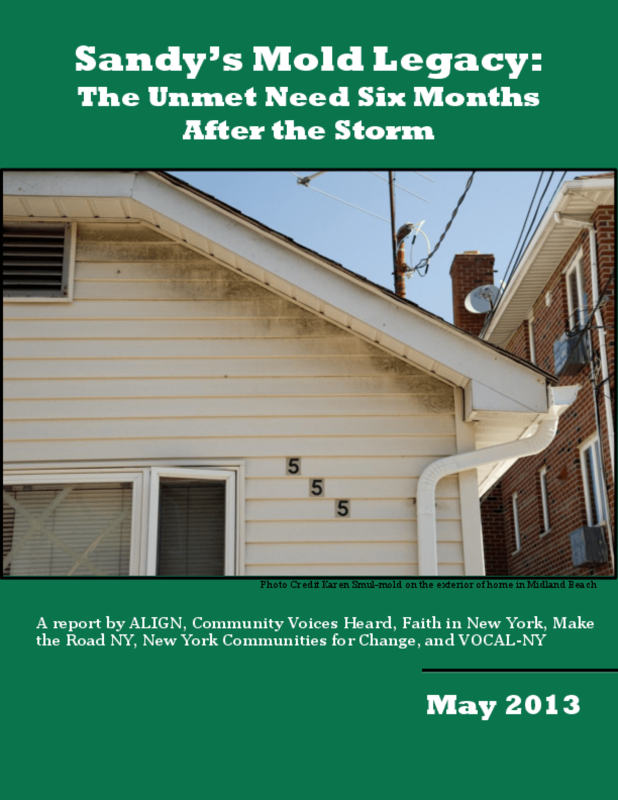 Members of the Alliance for a Just Rebuilding, a coalition of labor unions and community, faith-based, environmental and policy organizations across New York, have begun to survey residents in order to meaningfully assess the post-Sandy mold crisis across the city. In March and April, Faith in New York (formerly Queens Congregations United for Action), Make the Road NY, and New York Communities for Change conducted phone and door-to-door surveys across the Rockaways and in Staten Island, reaching almost 700 households. Feedback from residents forms the basis for this report's analysis of the threat of mold in hurricane-ravaged neighborhoods and our recommendations on how city leaders should respond to the crisis. Copyright 2013 ALIGN, Community Voices Heard (CAV), Make the Road New York, New York Communities for Change, Faith in New York, VOCAL New York (VOCAL-NY).